Craig David, aka Mr UK Garage and RnB will rock a new pool party at Ibiza Rocks every Sunday from the 10th July until the 25th September. 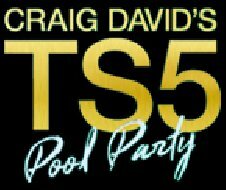 The aptly named Craig David's TS5 Pool Party started out in Miami as a cool house party for Craig and his friends at Tower Suite 5 and quickly became the most exclusive pre-party in Miami. Craig David will bring the South Beach Miami vibe to Ibiza Rocks this summer and will be joined by the likes of Big Narstie, Majestic, Matt Jam Lamont, Monki, My Nu Leng, Preditah, Toyboy & Robin and Zinc.